A rather unusual strain of global warming, defying the comprehension of the most seasoned meteorologists, struck the city of Toronto recently when it was inundated by a downpour of love that engulfed Canadians with tidal waves of selflessness and consideration, random acts of kindness and an appeal for a sense of social, environmental and spiritual renewal. 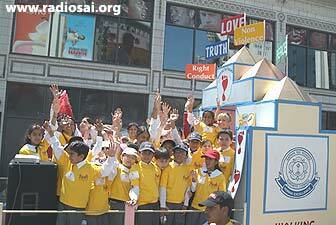 This heart-warming phenomenon had its epicenter in the Sathya Sai School of Canada located in Toronto -- a unique learning model that promotes human excellence by balancing academic achievement with character education based on the five human values of Truth, Peace, Love, Right Conduct and Nonviolence. With the precision of a NASA take off, at sharp 11 a.m. on Sunday, May 25, 2008, under sunny skies, a comforting breeze and a perfect temperature of 24 degrees Celsius, Toronto’s downtown core bloomed into a field of sunflowers swaying, singing, walking, talking and marching in blissful joy, determined to wake up the universal human values inherent in every heart. 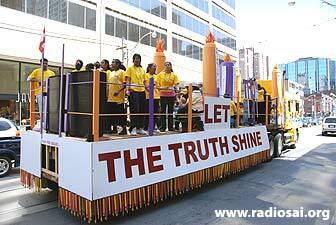 The virtues that form the core of the Sathya Sai School of Canada’s unique Character Education program, the Sathya Sai Education in Human Values, became the talk of the town. 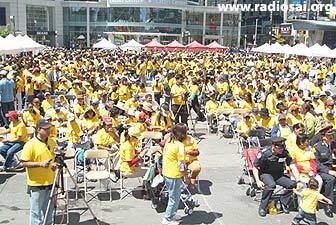 Thousands of Canadians, including children and young adults who cherish universal human values, pounded the pavement to reiterate their commitment to self-transformation, while serenading fellow Torontonians with value songs and seeking their active cooperation in their little efforts to make a big difference for the sake of our collective futures. They called upon everyone to step forward with them to infuse our communities with peace, honesty, integrity, and acceptance while eradicating violence, guns, crime and drugs from our society. Its relevance was not lost on first time participant Mahtab Roshanmehr, professional engineer, who first heard about the Walk for Values from a co-worker at a leading Toronto engineering company where she works. 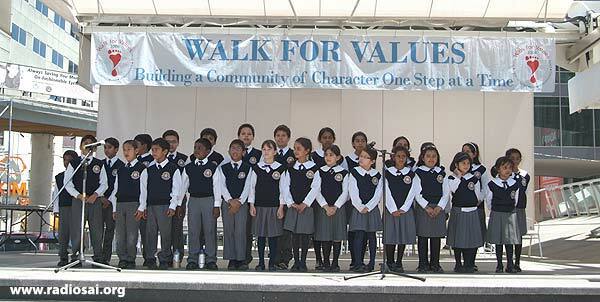 The Walk for Values is a non-monetary walk designed to promote individual responsibility towards the collective future of humanity, one step at a time. This unique initiative is part of a global drive to seed the consciousness with global affirmations such as love, hope, optimism, consideration, kindness, patience, honesty, integrity, forgiveness, acceptance, charity, volunteerism.... It calls for an honest self-appraisal from its participants who then identify one area of personal growth that needs to be strengthened and then pledge the needed self-improvement. As the students celebrated optimism, hope, commitment, honesty, and social responsibility, the air was charged with unmistakable love energy, and their joy was so contagious that even on-lookers were eager to catch the buzz and take a plunge into the vortex of virtues. 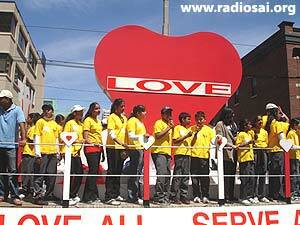 Two of Toronto’s most popular radio stations were broadcasting live from the scene of action, promoting the values and the altruistic vision of the walk during their broadcasts throughout the duration of the event. 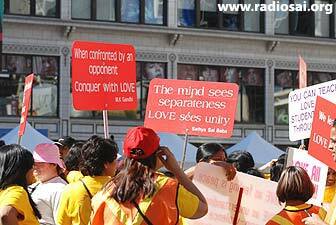 The sixth annual Walk for Values was once again supported overwhelmingly by the thousands of friends, media outlets and scores of community partners of the Sathya Sai School of Canada. Opening and closing ceremony resonated endorsements from representatives of the various levels of government, the law enforcement agencies and the vibrant multicultural population of Toronto, who came out to throw their weight behind the event’s humanistic focus. In September 2000, with the founding of the Sathya Sai School of Canada, for the very first time North American parents experienced the life-transforming impact of the holistic system of learning based on character education. The integration of the universal human values of Truth, Right Conduct, Love, Peace and Non-violence into the Ontario academic curriculum yielded results that extended beyond the students’ personal growth, to their families, impacting the home environment positively. 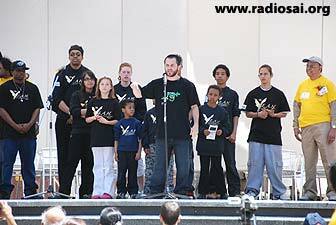 The grateful parents wanted to share their joy by taking the same message further into the wider community. 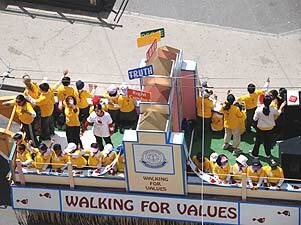 Thus in 2003, the idea of the unique community outreach project the Walk for Values was born and right from the outset, it struck an instant chord with caring Canadians, growing into a national and now an international event. 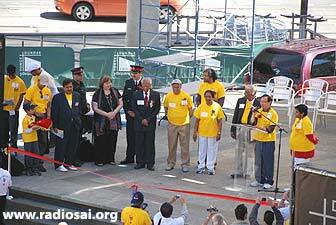 Inaugurating the historic march was the Central Coordinator of the Sri Sathya Baba Organization of Canada and the CEO of the Sathya Sai School of Canada, Dr. V.P. Singh, who reminded everyone of the simplicity of Sri Sathya Sai Baba’s message to Love All, Serve All and to Help Ever and Hurt Never.  School Principal Dr. Revathi congratulated the participants on their presence at the event and welcomed them all. Standing alongside, once again, was the school’s committed friend and city councilor Honourable Raymond Cho, who has always recognized the need for practicing universal values in all walks of life including governance, education, public policy, and municipal services. He delivered a congratulatory message from the Mayor of Toronto, Honourable David Miller, in which Mayor Miller expressed his pleasure that such an event takes place in that city every year. With four huge floats and thousands marching alongside, Torontonians proudly walked the 2.5 kilometer distance through the heart of Toronto ’s prestigious downtown hub to remind themselves, their fellow Canadians, and tourists to the area, of the need to practice universal human values that have no borders. While the students and bands belted value songs from atop the floats, marchers carried colourful placards with quotes on values from world thinkers, and the energetic value girls added to the joy and excitement of the moment with their inspiring value cheers. Closing ceremonies were also marked by a strong vote of confidence in the uniqueness of the vision that the walk expounds. These included a message from the Prime Minister of Canada Honourable Stephen Harper as well as Representatives of the Government of Ontario including the province’s Minister of Health and Long Term Care, Honourable George Smitherman, Liberal MPP for the downtown riding of Toronto Centre-Rosedale and MPP Honourable Bas Balkissoon, Chair, Standing Committee on the Legislative Assembly Member, Standing Committee on Regulations and Private Bills. Mr. Balkissoon, who has been an avid supporter of the Sathya Sai School of Canada and its brainchild the Walk for Values from the beginning, had earlier made a statement in the Ontario Legislature supporting it. In their speeches, both Members of the Ontario Legislative Assembly endorsed the need to practice universal human values to improve the quality of our lives at individual, community, national and global levels. Reiterating the same sentiment was Inspector Mario Di Tommaso of the 52 Division of the Toronto Police Service, who spoke of how the values that this walk emphasizes echo the efforts of the law enforcement agencies to keep our streets and homes crime, gun and drug free. 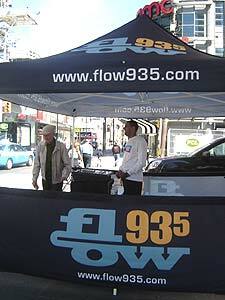 While Toronto’s prominent radio stations Flow 93.5 and EZ Rock 97.3 had their two SUVs on site, promoting the walk throughout the course of their broadcast, another popular station CFRM 1010 ( http://www.cfrb.com/media/723316/Walk+for+Values+Report) carried the news of the promotional event the students held ahead of the big day. Several prominent community partners including the YEAH (Youth Energized and Harmonized) from Brampton also supported the event where all participants received a healthy, vegetarian meal package upon arrival as well as a copy of the souvenir magazine “Value Today”. A multi-cultural program by community groups and performances by the Sathya Sai School choir and speeches by the students were some of the other highlights of the program. The uniqueness of the event is that it is neither a fundraiser nor a solicitation for monetary pledges. Rather, it promotes inner growth as an investment in personal and global awakening… a deposit in the future of all life forms on this planet including humanity. Participants in Canada, Australia and USA have been marching forward to fight social evils with weapons of mass appeal – universal human values. The ever disciplined and dedicated members of the Sri Sathya Sai Baba Organization of Canada from across the Greater Toronto Area poured in their love and energy to think through the last detail of the event, making it the most memorable Walk for Values ever. Exemplifying the dedication, discipline, and devotion of their role model and universal teacher Sri Sathya Sai Baba, the volunteers of the Walk for Values 2008 teams redefined the spirit of selfless service with their united effort, sincerity, and extreme hard work. Sai youth wearing their marshaling vests and safety helmets glided along the route on their roller blades, ensuring the smooth flow of the walk, relaying messages on their walkie-talkies and cell phones, and providing loving assistance where needed. The result was a love energy that was real, palpable and all pervasive. Proving the appeal of universal values beyond national borders, Chicago resident Salokya Tummala flew in from the USA to check it out for herself, having heard so much about the event. Describing how it felt to participate in this moving, pulsating and loving exhibition of Sri Sathya Sai Baba’s teachings, she says, “I felt blessed to be part of the event. 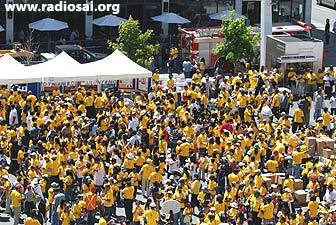 I was very happy to see that Sri Sathya Sai Baba's message is reaching so many people. 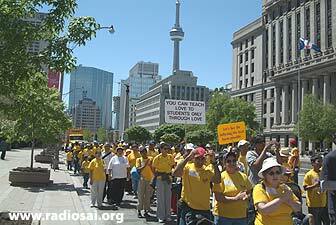 I was so excited to see such a large number of participants in Toronto downtown, full swing in action. That big banner ‘Love All Serve All’ caught my eye and I prayed immediately that I may practice this teaching more and more. The Walk is open to everyone: youth, children, adults, and groups representing schools, businesses, communities or faith groups. The walk involves diverse community groups who join hands to make the world a better place by carrying banners with quotes about values, ethics, morality and service; and through value songs, music, marching bands and colourful floats. 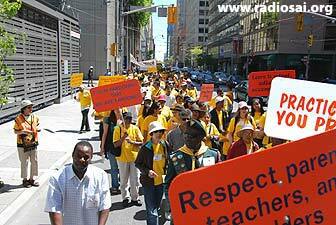 No monetary pledges are sought as the walk aims to raise level of human consciousness, not funds. 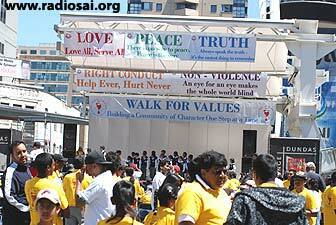 The resounding success of the Walk for Values 2008 in its flagship venue, the city of its birth, Toronto, on May 25 was further proof that in coming years, what began in 2003 as a little walk with barely 3000 participants, is all set to grow into an international phenomenon, proving the universality of Sri Sathya Sai Baba’s philosophy and its power to transcend all barriers of national borders, race, religion, culture, language, or region. 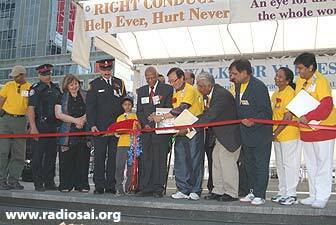 With each passing year, individuals, groups, businesses, representatives of the various levels of governments and community partners are eager to participate in and promote this unique community initiative of the Sathya Sai School of Canada, recognizing the relevance of human values in all walks of life and the need to include them in all areas of decision making. At this community outreach event, thousands of motivated human beings remind themselves and others to foster a kinder, gentler world based on the Brotherhood of Man and Fatherhood of God. For many, the occasion makes for a modest yet inspiring attempt to depict the selfless life of perennial caring, giving, helping and loving that is personified by Sri Sathya Sai Baba, the universal teacher, whose philosophy focuses on the underlying oneness that binds all diversity. 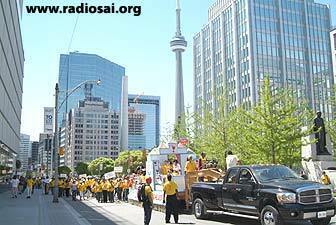 Every year, thousands who have benefitted by the practice of Sri Sathya Sai Baba’s example and teachings, express their gratitude by taking the message further into the most happening part of the city of Toronto, home to decision makers in the government, the financial district and the business hub, inviting everyone, including the tourists frequenting the area, to join them in improving the quality of their lives, and that of their families, communities and the planet, one step at a time. By wearing their heart on their sleeve, participants make bold and display the human value or its sub-value they wish to practice with greater intensity. This live exhibition of the gospel of Truth, Peace, Love, Right Conduct and Nonviolence of Sri Sathya Sai Baba is not limited to Toronto alone. Canadians in nine cities celebrate the glory of the most exemplary presence on the face of earth by holding the Walk for Values locally. This year, following Toronto ’s lead were Vancouver, Calgary, Edmonton, Saskatoon, Regina, Winnipeg, Kingston and Ottawa. 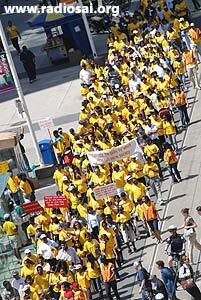 Since 2007, the Walk for Values has acquired international fame with conscientious Australians replicating Toronto’s brainchild nationally in six major cities down under – Adelaide, Brisbane, Canberra, Melbourne, Perth and Sydney. In addition, select jurisdictions in the United States of America started their own walks on the same theme of global transformation through self-improvement. To behold this experiential and public commitment to human values by its participants is a lively and moving sight, offering glimpses of the radiance of Sri Sathya Sai Baba and the life-transforming impact He has borne upon millions across the globe, including grateful Canadians. At this exposition of universal human values, the displays are not limited to attractive billboards or models and pictures. Real people driven to a higher life purpose, ranging from tiny tots to the elderly and everyone else in between take on personal responsibility, and assume the role of live exhibits who deliver Sri Sathya Sai Baba’s simple message for our collective good…a heart-warming global warming phenomenon that is being welcomed everywhere by seekers to quench their spiritual thirst. Dear Reader, did you find this article helpful? Would you like more such Sai News? Please write to us at [email protected] mentioning your name and country. Thank you for your time.